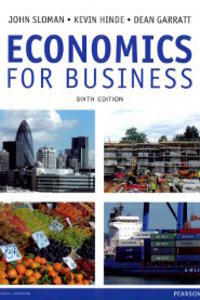 This book provides coverage of microeconomic, macroeconomic and international economic issues for business students. With its direct and understandable approach the book continues to focus on applying economic principles to the real world of business. Up-to-date case studies examine everything from the impact of the financial crisis to the operation of specific businesses, to illustrate how economic theory relates to real business issues. The book has been thoroughly updated to reflect the challenges faced by business in the current economic climate. in one user-friendly book and is ideal for anyone studying economics with a business perspective. Sloman, J.; Hinde, K.; Garratt, D.